Curtain Mode provides the ability to hide the console desktop on the remote screen while the operator remote controls it. This allows the operator to work on the desktop in a secure manner while the remote screen is blocked from public view. 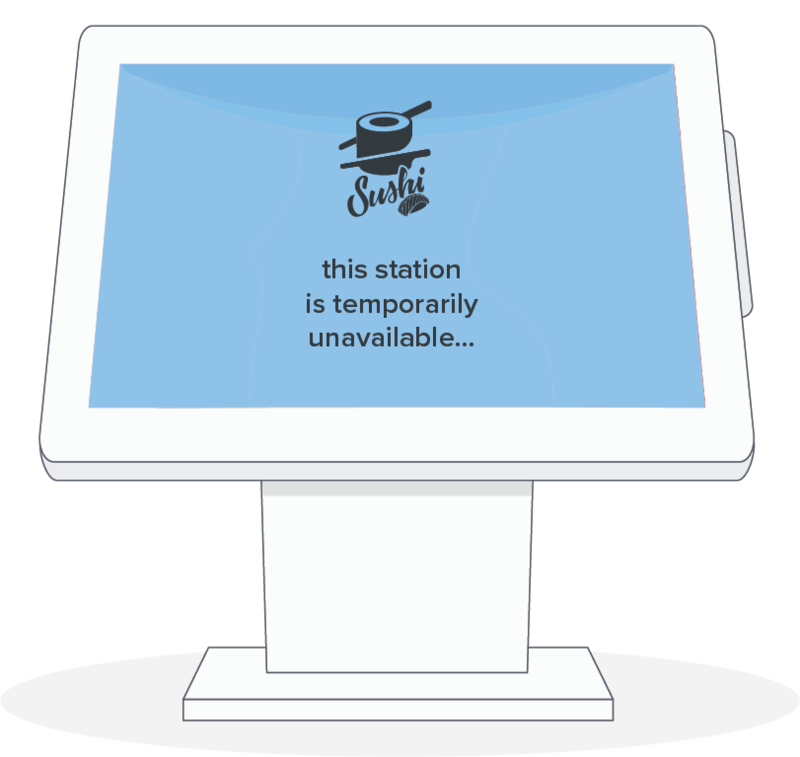 Curtain Mode is particularly useful when working on public kiosks or external displays. There are several types of Curtain Modes that can be applied to remote systems. The Goverlan default Curtain Mode screen displays a generic maintenance message while the operator works on the actual desktop. The center logo and text of this screen can be customized globally using the Client Side Text and Logo Customization policies. For further customization and branding, a full screen image can be used as a curtain screen. The image will be scaled to the resolution of the display device while keeping the aspect ratio. Any screen area not covered by the image will be filled with a configurable color. For best experience, you can redirect the Curtain Mode screen to an internal web page. A web page with a responsive designs are best suited to accommodate different screen size and orientations. This mode is only supported on Windows 8.1 and higher. See the Goverlan Reach Server. These Policies are included in Goverlan Reach Server version 3.01.24 and up. If you already have a Remote-Control Client-Side Configuration policy on your server, you will need to delete it and re-add the policy to include the new settings below. 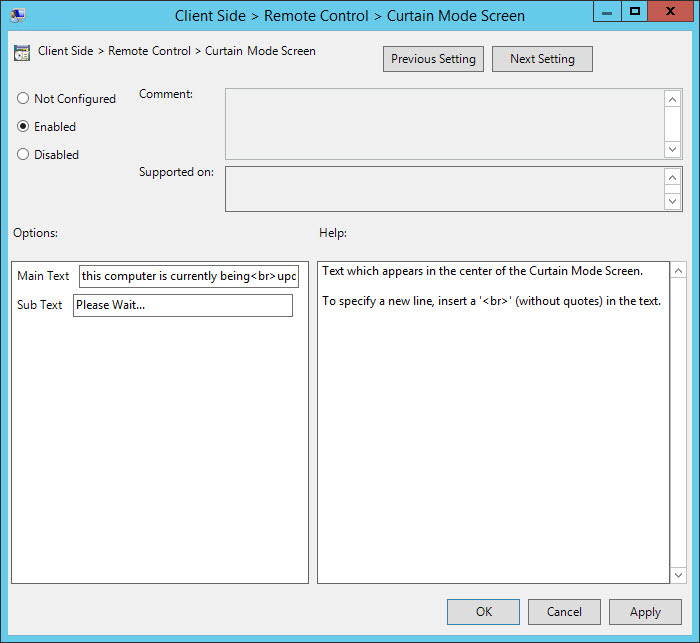 Open the following policy set: Remote Control Client-Side Configuration, and select the Curtain Mode Config category. Enter URL of the website that displayed when Curtain Mode is active. Note: Use the Full Screen Static Image Background Color policy to define the image backdrop color. Select the color to display for any area that is not covered by the Full Screen Static Image. 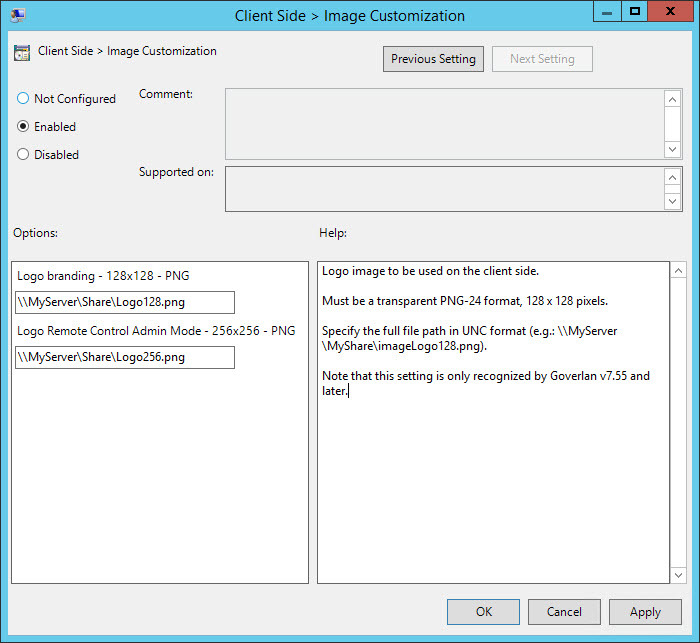 Open the following policy set: Client-Side Text Customization, and select the RC – Curtain Screen category. Open the following policy set: Operator Restriction Policies, and select the Remote Control category. 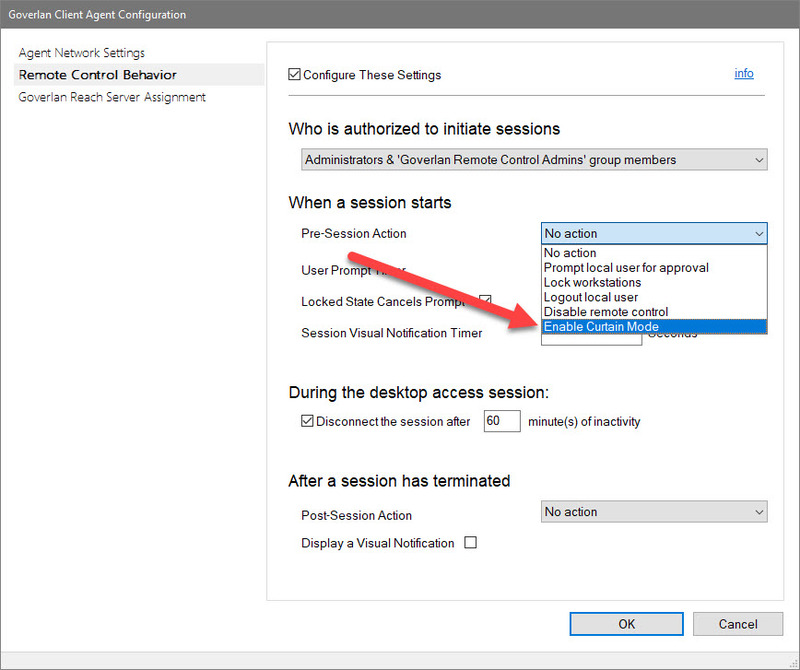 Operator Restriction Policies allow admins to disable the ability to enable or disable curtain mode. 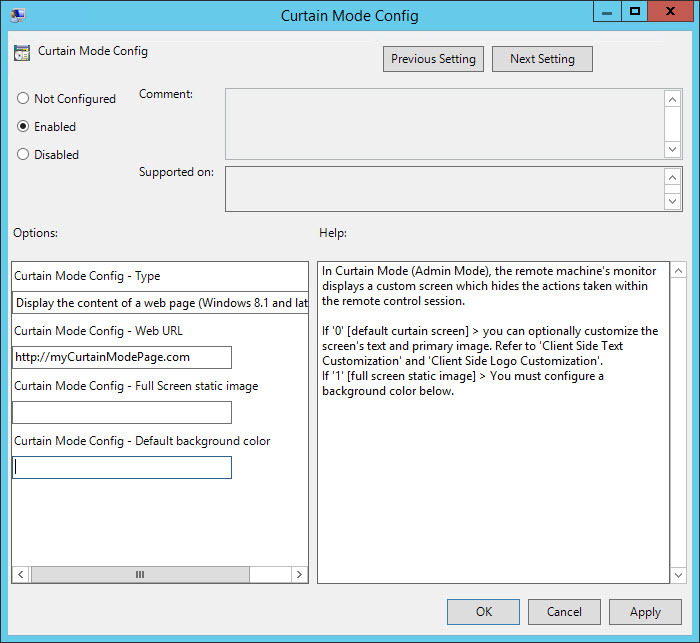 If you are using the Goverlan Group Policy Template, you will need to update the template to reflect the new policy options for Curtain Mode. For more information see Global Goverlan Configurations via GPO. NOTE: The Curtain Mode Color Config must be entered as a Hexadecimal color code. 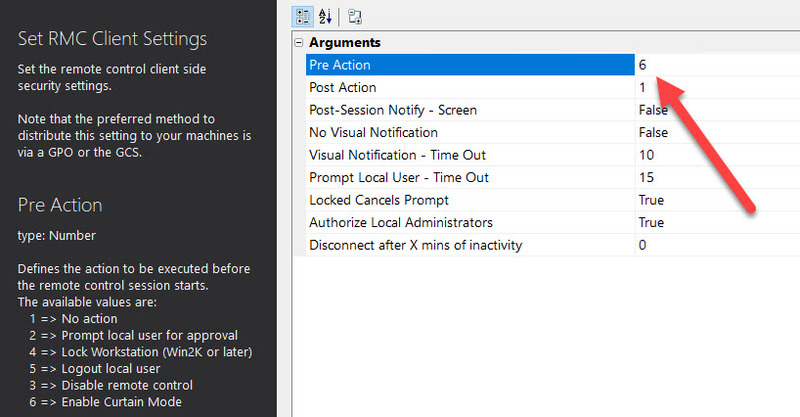 The Goverlan Agent Manager allows you to push pre-session action behavior for Curtain Mode or to generate an agent with this setting built in. For more information see The Goverlan Agent Manager. 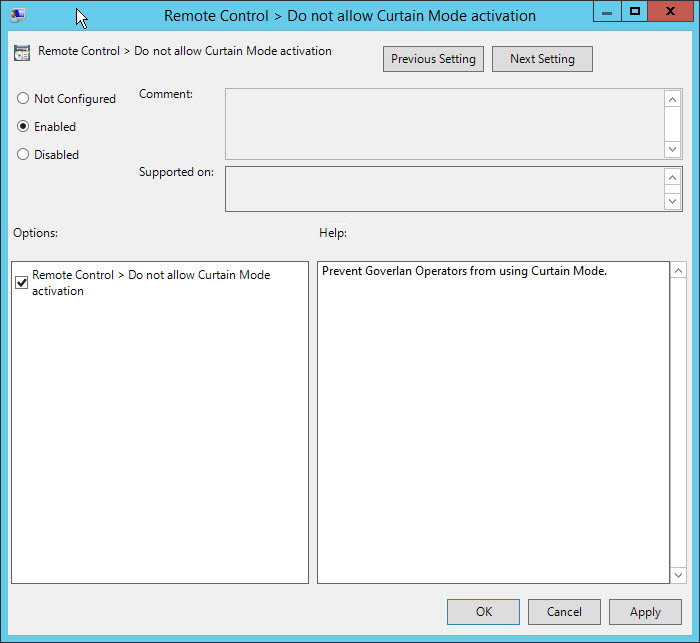 Use the following Process Automation to enforce curtain mode on your systems. For more information see Process Automation Overview. Set type to 6 to automatically activate Curtain mode when connecting to a remote machine. 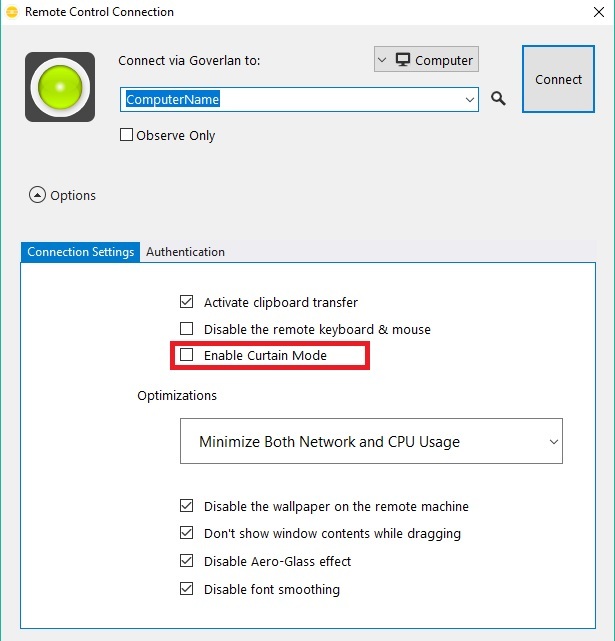 To enable Curtain Mode before a remote-control session begins, check “Enable Curtain Mode” on the Remote-Control Connection screen. 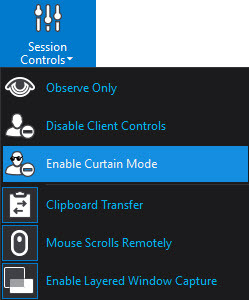 To enable Curtain Mode during a remote-control session, go to the Controls Tab, Session Controls –> Enable Curtain Mode.